UPDATE: This giveaway will be open until Tuesday August 28 th. 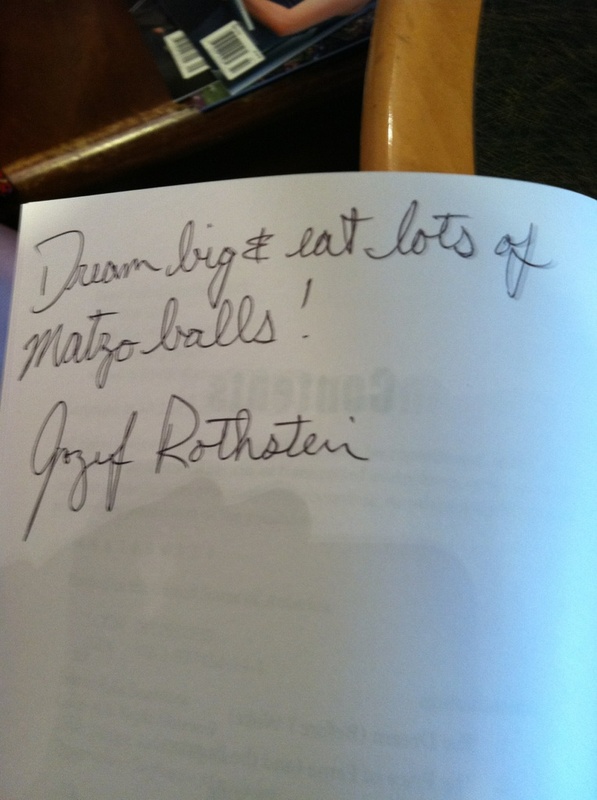 On Sunday, August 5th, I had the pleasure of meeting Jozef Rothstein, author of As the Matzo Ball Turns at our local Barnes and Nobles. As we charged his table (yes, my sister-in-law and I bought five books) I knew immediately by his huge bright smile that he was going to be fun and interesting. Talking to Jozef was like chatting with an old friend. I had so many questions (maybe too many) and Jozef eagerly answered every one of them. His sense of humor shined through the entire conversation which I adored because as I told Jozef, I tend to bond with people immediately if our sense of humors match, which his and mine definitely did. I had to pull myself away from his table, because I didn’t want to sabotage his book signing, but it took every ounce of restraint not to run back every five minutes to chat. He was that much fun. Jozef was totally cool in agreeing to answer some interview questions for my blog. 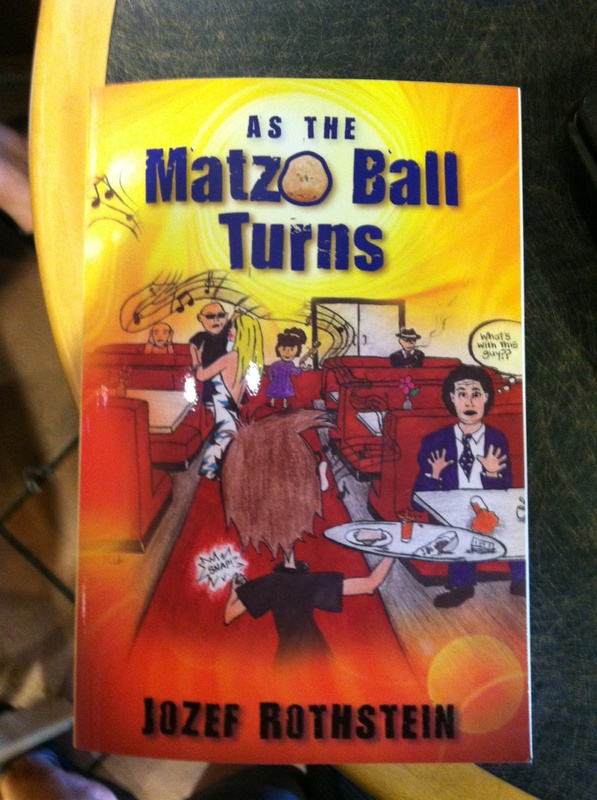 Be sure to include a comment at the end of the interview because you will have the chance to win a signed copy of Jozef’s awesome book As the Matzo Ball Turns. One reader will be chosen at random. All you have to do is comment. I’d love for you to follow my blog or me on twitter @Yolaramunno but you don’t have to in order to win. If you don’t comment you can’t win. As with all interviews on this blog, answers from authors don’t necessarily reflect my views regarding the industry. Hi Jozef how are you? Dandy. Now that’s a word you don’t hear much anymore!!! I am just dandy! First, I’d like to thank you so much for stopping by Writing Like Crazy. Thank you for having me Maribeth. 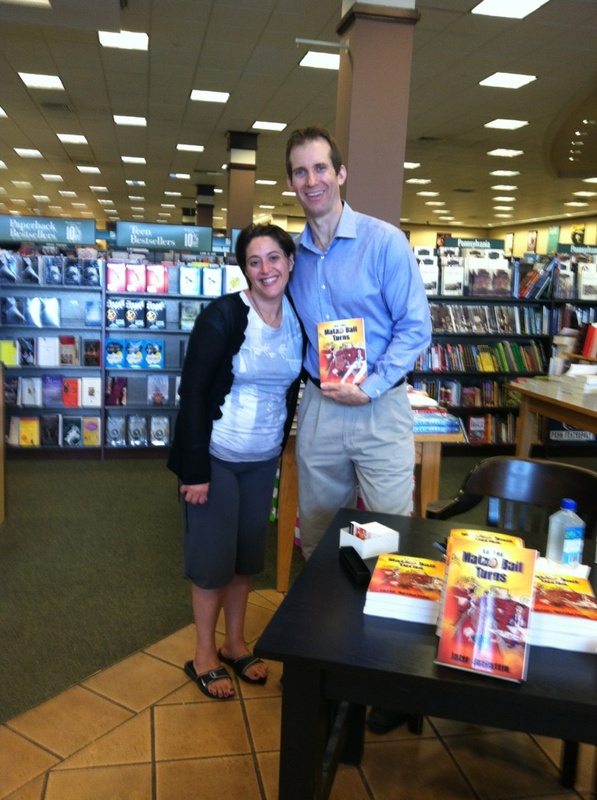 It was so much fun rapping with you at the book signing I was chomping at the bit to do the interview! I like to start right from the beginning, if that’s okay with you. First, did you always want to become a writer or was your journey (living in Hollywood with stars in your eyes) what inspired your writing career? Wow, that’s a loaded question!!!! I really have no idea. Hmmm. Let me think about it. How much room do I have? Okay well, I remember writing funny stories in my fifth grade creative writing class that the teacher would read aloud. (And then there was this time at band camp … ) I would pick one classmate per week to build a story around and put him/her on the spot. My teacher and my peers found them humorous, as long as they weren’t the subject of my ridicule that week. AND everybody looked forward to my holiday cards. They didn’t get me any after school kisses but I really enjoyed writing them. Then came high school. I was a gangly teen who looked like a praying mantis. That has nothing to do with your inquiry but I thought I’d mention it anyway. I really got into sports for a while but I eventually wandered out to Hollywood where my writing career was born out of necessity. I have always admired people who could pack up everything to go follow their dreams. Can you tell us a little bit about your choice to leave your small town in Pennsylvania to go to Hollywood? I equate it to the first time I went skydiving. I am six feet five inches tall and as we climbed to five thousand feet, the altitude for my first jump, I was crammed into a tiny little Cessna with like seven other people. I was scared as hell but I was so boxed in for so long I couldn’t wait to jump out of that sardine can and stretch out a little. How did that first year go? Well … It depends on who you ask. First, a little background. I ended up taking a liking to the game of football but one crazy life story later I ended up taking a year off after college and then tried to get back in the game. I was acting as my own agent and I got so insanely obsessed with obtaining an NFL career I would call people like Mike Ditka and I don’t know, threaten to eat him and his children if he didn’t bring me into training camp. Believe it or not, this approach was somewhat successful and almost landed me on a couple of rosters. 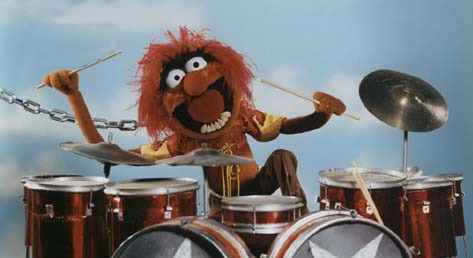 An NFL career just wasn’t in the cards so I exploded onto the Hollywood scene like a clown shot out of a circus cannon. At first, I grabbed the attention of every big player in the business. But this quickly backfired and worked against me. After my first year in town, unbeknownst to me, I believe my aggressive approach, which had worked so well in football, landed me on every blacklist in Hollywood. It did, however, get me several recommendations for the crème de la crème of acting teachers who were an interesting case study in and of themselves. I spent five years immersing myself in the craft learning various techniques with the best coaches in the business. I worked so hard, I actually became quite good at it. It’s the story of someone entering the dog eat dog world of Hollywood wearing milk bone underwear. The pitch line for it is “An aspiring actor’s ten year encounter with hit men, celebrities and old Jewish ladies.” To sum it up, it is the story of someone who arrives in Hollywood with a suitcase and announces to the world, “I want to be in movies!” This is the real story, not the E! True Hollywood story, of what 99.9% of people go through, for as many years as they can stand it, before they are sent back to where ever it is they came from with their shattered dreams folded up in their suitcases. And like almost everyone in LA LA land the only way to earn a decent living while aspiring for a star on the Hollywood Walk of Fame is to become an indentured servant, oops, I mean waiter. And since everybody and his brother Harry is trying to do the same thing, (If you throw a rock you hit two hundred of us), you are a very disposable commodity at best. I just so happened to pick a very notorious Jewish deli for my ten years as professional whipping boy where most of the hilarity and hijinks in this story occur. And, of course, that’s where the backdrop for the book is set. It started out as a joke because everyday at the deli there was so sort of heavy drama going on, much like a soap opera. In a deep announcer’s voice I would observe, “Today, on As the Matzo Ball Turns, John’s boyfriend threatens to leave him if he doesn’t stop performing at the local drag queen bar.” On my way out of Hollywood doing 120mph the title kept repeating itself in my head. With lots of time to think while driving across country with my two dogs, the rest of the story started punching its way out of me. In all my years as a writer I believe every great story starts with a great title. I believe the title has to excite you about your story and from there the rest just falls into place. 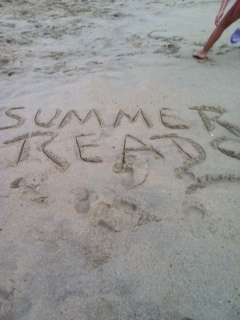 Readers get an immediate hint at what type of work you landed out in California by the books jacket. Clad as a beaver in Speedo trunks and Scooby Doo cape while surrounded by beautiful women dressed to the nines. Can you give us maybe a small snapshot of this moment? It is the equivalent of stepping into a nice warm shower only to have it interrupted by ten federal agents in riot gear who mistakenly arrest you and drag you out into the middle of the street stark naked while the entire neighborhood watches on in horror. All the while your turtle is in the shell, if you know what I mean. You and I connected on a couple of things. You wait tables in your spare time; I waited tables since I was thirteen years old so I can relate to the waiter/waitress stories. There is a part in the book where you had to wait on a very famous person on Christmas day (I won’t say who the celebrity is-we will make the readers curious ;)) who wasn’t very nice. Your description of standing in front of her asking if she would like a drink while she ignored you hit home for me because I myself have had those moments while waitressing, many times, but never by someone famous. Did you know at that moment that incident would end up in your book? You mean before or after I imagined myself cutting her in half with a chain saw? I honestly had no idea at that point in time there would ever be a book, let alone a book written about those types of experiences. As a matter of fact, I simply wanted to move on with my career in entertainment and never re-visit them again. Back then, I would have never believed a Hollywood career would not happen for me. But when the light finally turned on after ten years of beating my head against a cement wall and other factors (that are listed in the book) sent me flying out of Los Angeles with a ball of flames shooting out from behind me that’s when the idea of looking back and having one last laugh became very appealing to me. Okay, now on to some industry questions. It was like giving birth to a hippopotamus, but I truly believe when it’s your time it’s your time. I had been raging against the machine for quite some time so it only made sense that my publisher would be detached from the Hollywood establishment and the crony media conglomerates. After getting anywhere from 50-100 rejected query letters and exhausting my Hollywood insider connections I put a call out to an independent producer friend who knew a lot of people. This guy really liked my previous writings and I thought to myself what can it hurt? He was actually planning a dinner meeting with a good friend who was in town and whose mother is a successful publisher. A few weeks later they were reading my work and I was getting the green light. The rest is history. Do you remember the moment you declared yourself a writer? The day Universal Studios returned my call based on a pitch I left on someone’s answering machine for my first screenplay which was written entirely in pencil. I didn’t have a computer at the time so I had to have a friend who worked at MGM type it up for me so I could present a professional copy. You are a semi self-published author is that correct? Yes, even though I’ve bared some of the up-front costs, I had to have their stamp of approval on the material in order for them to publish it and the book had to be good enough for them to want to distribute it. Again, I absorbed most of the costs (which is very typical today for almost any first time author unless you are Paris Hilton writing your memoirs) but the upside is a bigger back end for me. I have an unbridled entrepreneurial spirit and a very clear and concise artistic voice. I refuse to have it compromised for any reason whatsoever and this situation allows me to have the best of both worlds. I couldn’t be happier. Can you share with my readers how you went about getting your book out there and what resources you used? At this stage of the game, I just used my instincts and the relationships I had built over the years. I am definitely a one man army when it comes to tireless self-promotion and I believe in my work so I am also like a used car salesman gone wild. There are days when I wish I had an off button but overall I am very proud of the book which makes me want to get it out to people even more. If I have to spray paint the title on the side of my car I will, but I will not stop until As the Matzo Ball Turns reaches the New York Times Best Seller List. Before you decided to take this route, did you try the traditional methods of querying agents? If so, how many queries did you send before deciding to do your own thing? Again, even though I sent out 50-100 queries I knew in my heart of hearts I had to take the grassroots approach but I had no idea how I was going to accomplish it. There is no doubt in my mind that this publishing and distribution set up is the right thing for me because I have never had things fall into place so naturally in my entire life. If I started writing them today I wouldn’t finish them all in this lifetime. But, right now, with my work schedule and the non-stop promotion of this book, I have absolutely zero time to write. I already thought out a sequel to As the Matzo Ball Turns and have another more serious book to scribble down after that. But, I would honestly like to take a stab at making another movie. I worked on one film while I was in LA and learned so much from it I just have to get my hands on another one. And I have a great screenplay to boot. Okay, I know your head is probably spinning from all of these grueling questions but I like to end my interviews with some fire questions. You ready? On the john or on the floor while petting my dog, Charlie, who is also a character in the book. He made one public appearance for a book signing and it will most likely be his last. I left him out of my site for just one minute and he scared the death out of two middle aged men entering the store. He was dressed in bow tie but acted more like he was wearing a pin striped suit. Playing solitaire before and after each writing session. I know I just drew ire from the entire writing profession for falling into the lonely writer stereotype but what can I say it relaxes me. And what writer isn’t a little bit of a loner? I scribble down notes. My desk looks like that of a mad scientist. I call it organized chaos. Hahaha. I like yours. For me, it would have to be a bible. Besides all of these silly questions, I am reading Redemption 4th edition. Long story. It’s not so much for enjoyment as it is personal knowledge. But the truth of the matter is, with this latest endeavor I barely ever get time to read for pleasure. I squeeze it in when I can. I am very into the freedom and truth movement so two people come to mind. Both are people I loosely know. Sheriff Richard Mack and G. Edward Griffin are incredibly insightful, courageous and intelligent. If you care about the state of the world and value freedom and prosperity you should read their works. It is your duty! Duty. Only because the comedic side of my brain just doesn’t want to turn off right now. Okay, one last thing I promise. Can you tell my readers where they can purchase your book? I thought you would never ask! Well, if you live in either the Wilkes-Barre or Allentown area you can walk into the Barnes and Noble store either in the Wyoming Valley Mall or Whitehall Mall and snag one right off of their shelves. Other than those two locations (at this point in time anyway) you can order it from a store clerk at any Barnes and Noble store across the country and just about any other book store nationwide. But being that it is the 21st Century, you can also order it through amazon.com or barnesandnoble.com or by simply going to my blog at www.asthematzoballturns.com . Links are provided on the blog for the other online sellers as well and the book is also available for download. Jozef, I wish you nothing but tons of success. You are an awesome, funny writer and I hope we stay in touch. Thank you very much Maribeth. I hope so too. Jozef, please let my readers know where they can find you. Your blog, twitter, facebook, any social networks. My blog is www.asthematzoballturns.com , you can friend me, Jozef Rothstein on Face book and my email is jozefrothstein@yahoo.com . Thanks for your interest and happy reading!!!!! Hey, hey, I’m back. My blog has taken a brief hiatus in recent months and now it’s time to return. I have some cool things coming up that I hope will please my readers. In the next few weeks you will be able to enter a giveaway (for a signed copy of a super funny book), read an interview (from the author who wrote the super funny book), participate in writing exercises, read some ramblings and hopefully gain some useful information. So, keep reading for new updates and blog posts. Okay, let’s get to today’s post. 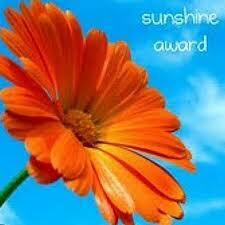 Yesterday I received a Sunshine Blogger Award from fellow writer A.F.E. Smith (which instantly made me smile). In accepting this award, I am required to answer a series of questions and then pass the torch (aka Sunshine Blogger Award) to other bloggers who I think deserve the award too, link my nominees to this post and comment on their blog letting them know of their nomination. Below are my answers and the blogs I have nominated, keep reading to see if you are one of them. I love them all. But, A Christmas Story is definitely my favorite. I remember watching it with my father for the first time and laughing at both the movie and the fact that he was laughing so hard. You’ll shoot your eye out kid, the leg lamp, the brother stuffed into his snow suit, the infamous fight scene, Flicks tongue sticking to the pole, Ralphie muttering the f word, Santa kicking him down the slide, enough said. I love the movie. Runner ups are Ebenezer Scrooge: A Christmas Carol. Who doesn’t love this movie? Redemption, love, reflection, family and ghosts, it has it all. I can’t not mention Rudolph and Frosty, I love them too. Wow, I’m having a tough time giving one answer. I have to include two answers for this one as well. My favorite flower for inside the home are Gerber daisies. They are colorful, cheerful, pretty, and make me happy. For outside the home, I love orange Tiger Lilies. These beautiful flowers bloom the week of my oldest daughter’s birthday every year. For me, the orange tiger lilies symbolize birth and joy. Plus, I have always had a thing for the color orange. 3. What is your favorite non-alcoholic beverage? My mother’s fresh brewed unsweetened Iced Tea with lots of ice. It is simply the most refreshing drink. I think it is better than any bottled tea on the market. My passion is without a doubt writing. I will write until the day I die. It is not only a passion for me, it’s a calling. 6. What is your favorite time of day? I have been a night owl ever since I could remember but as I get older I am beginning to thoroughly enjoy the early evening hours. 7. What is your favorite physical activity? I always enjoyed Yoga but have gotten away from a daily routine. There is something euphoric about balancing the mind, body and spirit. 8. What is your favorite vacation? Anywhere my family is. I love the beach but one day I hope to have a vacation home on a lake. Each blog I have nominated as inspired me at one point or another. Keep writing, you never know who might need your words. If your blog has been given an award, make sure you post your button award on your blog, answer the eight questions and then nominate ten others. Have a sunny day!